This entry was posted in Announcements, Broadcast Media Production, CCM Division, Faculty, Filmmaking, Interviews, Movie Reviews and tagged #myChamplainValley, At the Box Office, CCM Division, Champlain College, filmmaking, Isn't it Romantic, Julia Swift, movie review on March 3, 2019 by jschultz. This entry was posted in Announcements, awards, CCM Division, Events, Faculty and tagged CCM Division, Champlain College, Jim Ellefson, John Rasmussen, Office of the Provost, Rosalynne Whitaker-Heck, Student Experience Grant on March 1, 2019 by jschultz. This entry was posted in Announcements, Broadcast Media Production, CCM Division, Faculty, Filmmaking, Interviews, Movie Reviews and tagged CCM, Champlain College, Julia Swift, movie review, My Champlain Valley, The Favourite on February 10, 2019 by jschultz. This entry was posted in Announcements, CCM Division, Events, Faculty, Photography and tagged CCM Division, Champlain College, jordan douglas, penny cluse cafe, Photo Exhibition, Photography on February 10, 2019 by jschultz. Associate Professor Keith Oppenheim’s new documentary is about a nontraditional choir—the Noyana Singers—who you won’t find performing in the local church. 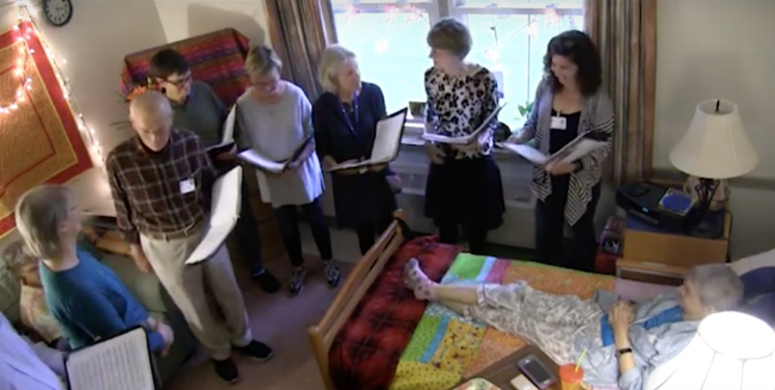 The choir sings to terminally-ill residents at Respite House, Colchester’s hospice house. This entry was posted in Announcements, Broadcast Media Production, CCM Division, Events, Faculty and tagged Broadcast Media Production, CCM Division, Champlain College, Champlain College News, Documentary Premiere, Keith Oppenheim, Noyana Singers, Respite House Hospice on January 23, 2019 by Rosalynne Whitaker-Heck.